As users multi-task more and more, specifically while watching TV, brands have an opportunity to provide not an ad on 2 screens but rather an experience that leverages 2 screens and ultimately delights and entertains viewers. Once the user goes on this journey, it becomes a great way to expose more content to a consumer that is self selected as the user always maintains total control as well as an easy way to purchase. Our process for ideation was simple, how can we create a consumer experience that was playful and tapped into the research of multi-tasking. The series of second screen concepts were brought to life and were showcased in the Cannes Lions Festival at the Microsoft beach club. 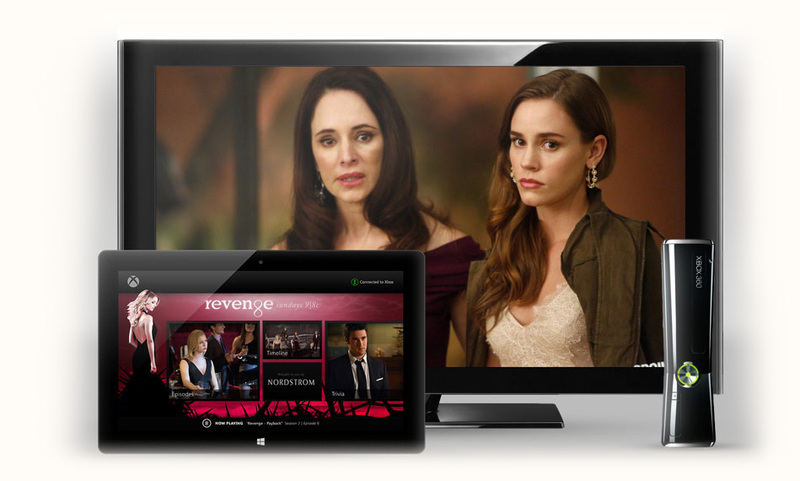 // 01 – User is watching a show (Revenge) and has a companion app on another screen, in this case the media is playing on the TV and the tablet has the additional content from the show, aka second screen. 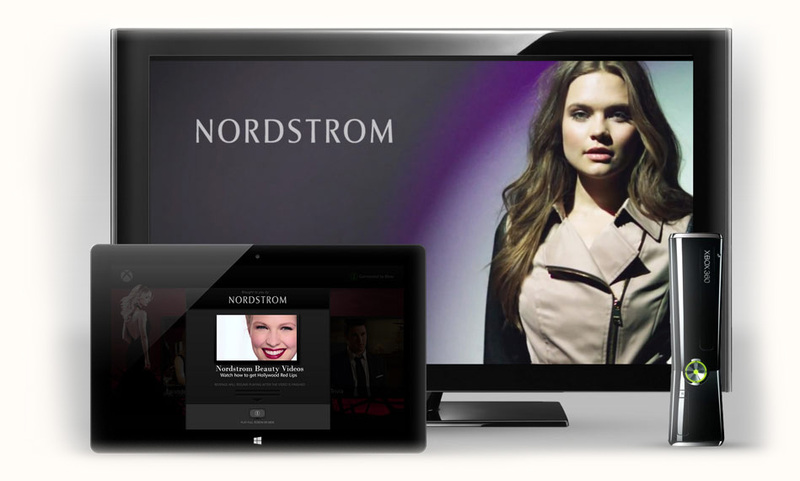 //02 – A commercial break from Nordstrom appears and on the tablet an overlay is mapped to that brand with a call to action to watch more addition content from Nordtsrom. User clicks on overlay – at this point the user can explore more content from Nordstrom but return back to their show at any point. 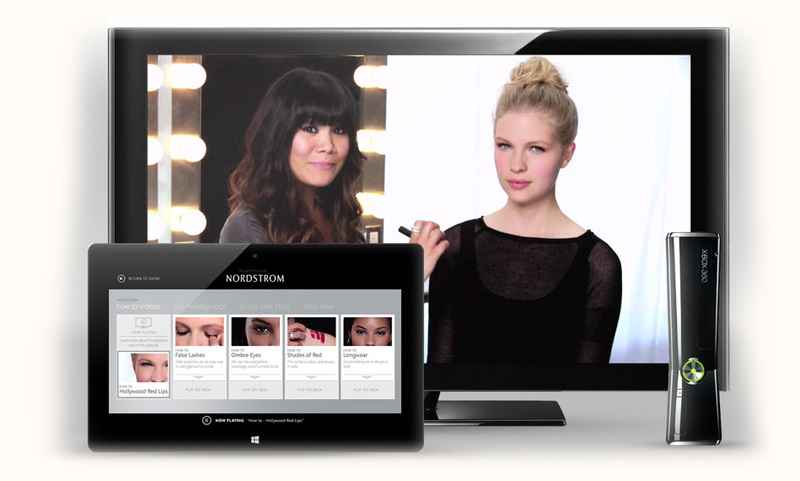 //03 – User is now viewing additional content videos from Nordstrom. As they select a content item, it will play on their TV. //04 – Users now have an easy way to actually purchase products that were spawned from a traditional :30 sec spot and explore other brand content on the largest screen in the house. Syncing the screens together leveraging Smartglass, users watching a show on TV and be presented with a typical :30 sec advertisement. 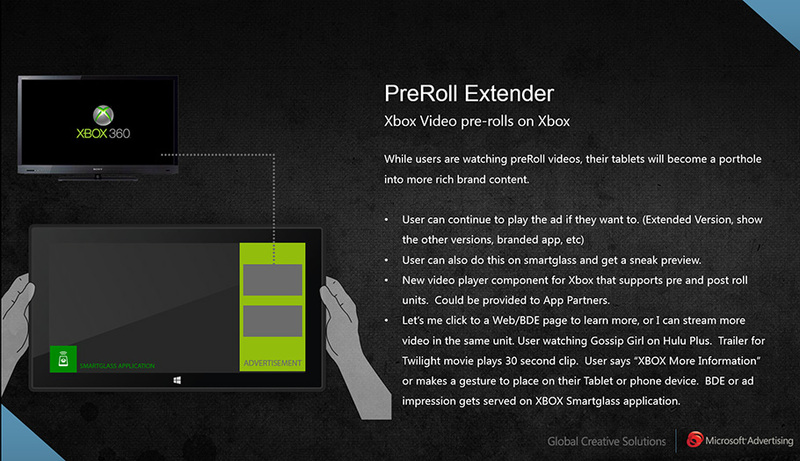 At the same time, an overlay on their tablet would reveal a call to action to explore more content. When the user engages on their tablet, the tablet screen turns into a mini-navigational and informational app that acts as a remote to “push” content from the brand to their TV. Using the tablet to control the TV, the users could send videos, photo galleries and even car customizers to the largest screen in the room taking the small screen experiences and generating beautiful HD experiences. Syncing the screens together leveraging Smartglass, users watching a show on TV and be presented with a typical :30 sec advertisement. When the ad starts to play assets from the TV spot flow into the tablet screen and creates an eye catching 2 screen experience. The concept called “Flow” started with many rapid motion tests and technical feasibility explorations until we solidified the experience into something that Kraft’s agency could take and build custom content around.